I was in Philadelphia this past weekend for a family wedding. As yet another bridesmaid, your obligations are soley to the bride and it is your duty to be available for her at all times. As honored and as much fun as it was, by the end of the weekend I had to be sure to fit in a true Philadelphia experience before returning home and my boyfriend NEEDED a Philly Cheese Steak. 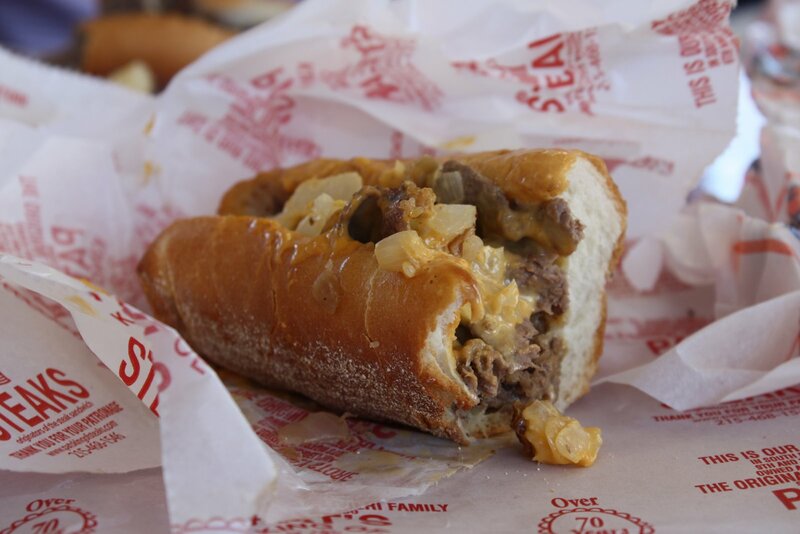 My cousin gave us two suggestions without hesitation: Pat’s or Geno’s, the two top-rated Philly Cheese Steaks in town. Located just across the street from one another. We drove to the Italian South Philly neighborhood hungry and ready to chow down. 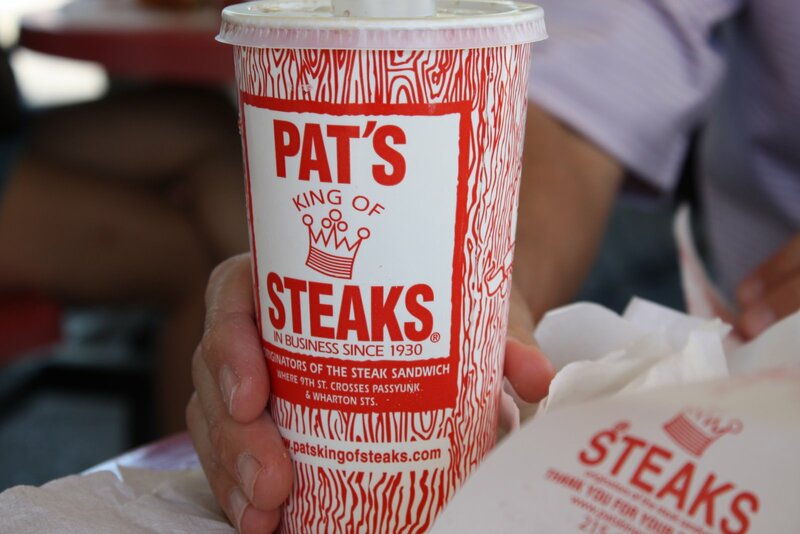 Contender #1: Pat’s King of Steaks. Location: Where 9th Street crosses Wharton & Passyunk Ave in Philadelohia, Pa.
History: Founded by Pat Olivieri in 1930. 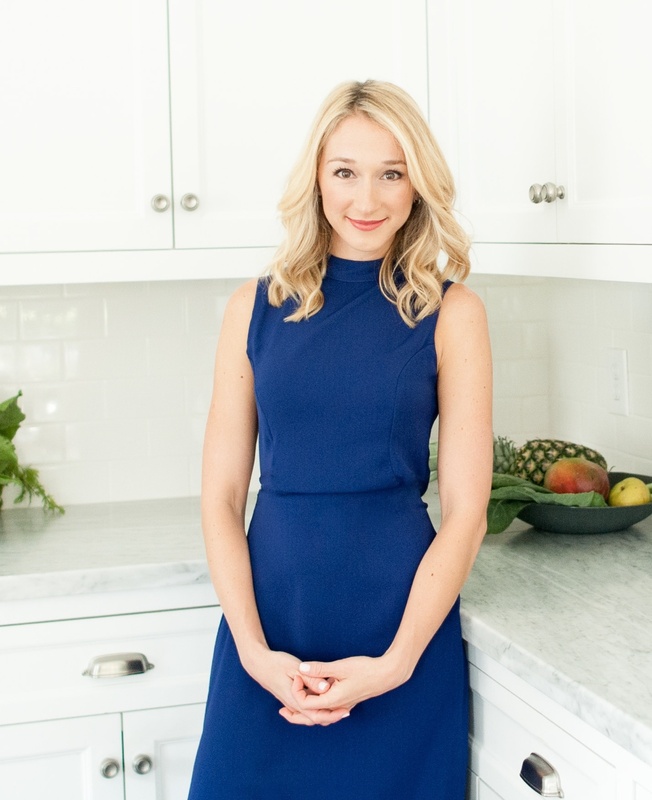 Started as a modest hot dog stand in South Philly until he craved something new and created the steak sandwich. 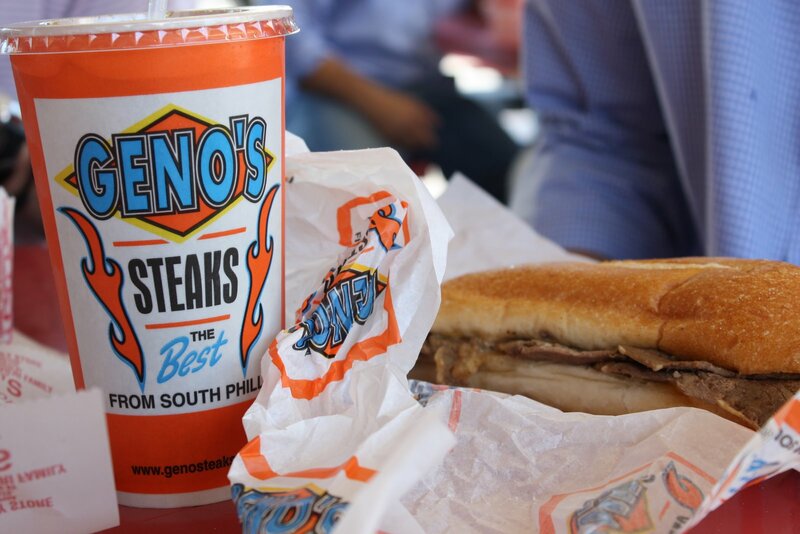 Contender #2: Geno’s Steaks. Location: At the X-shape intersection noted above. History: Founded by Joe Vento in 1966. Learned everything he knew from his father who opened Jim’s Steaks in the 1940’s. *Sidenote: We were warned that the most important thing you must know is how to order. The service is fast. The line keeps moving. You better be ready. Your Cheese Steak options include three kinds of cheese: Provolone, Chedder, or Cheese Whiz (the only way to go by the way) and with or without onions. So for example, if you want Cheese Whiz with onions you say “Whiz wit”. If you want Cheese Whiz without onions you say “Whiz witout”. Notice the “t” in place of the “th” in the word with. You need to fit in with the “Yo Philly” accent here. This is just the first window. The second window is for drinks and fries orders. Half of our group went to Pat’s, the other 2 went to Geno’s and we met back at Pat’s outside picnic tables for the Ulitmate Taste-off. Both cheese steaks were just heavenly so we had to get down to the nitty-gritty. Pat’s bread was softer and the cheese and onions were piled on top of the steak (which I thoroughly enjoyed). Geno’s spread their cheese on the bread first and then placed the steak and onions on top (which I found not as moist). Based on these critiques, I have to go with the one that has been around the longest. My title for “Best Philly Cheese Steak” goes to Pat’s! reading that makes me want a cheese steak!!! YUM!